What do you need for a simple, safe and consistent Hollow-Taper-Shank tool clamping (HSK)? 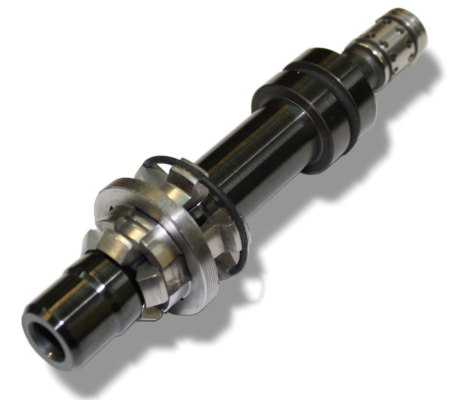 Tool spindle manufacturers know of all of the problems that come with a spring-based taper clamping system – a complex and stacked design combined with inconsistent balancing and shaft dynamics, spring-fatigue, inconsistent clamping positions and pull-in forces at excessive servicing. Existing self-locking clamping systems on the other hand appear to be too complex and show quite different problems. Due to the serial combination of several taper connections these clamping systems have not only to cover a broad travel range, but also suffer from changes in clamping position and pull-force due to non-predictable changes in tribological conditions. Self-locking taper clamping system that comply with the current state of the art also use a self-locking unit connected to a standard clamping unit which can be used with other clamping systems. This again affects the already large change in clamping position. Our new developed and patent pending spring-less automatic clamping system for Hollow-Taper-Shank (HSK) tools with optional aerostatic rotary feedtrough is based on the principle of a monolithic pre-loaded self-locking. For this the clamping and the locking unit used with other spring-less clamping systems are combined and reduced to only one single unit of a very simplistic design that covers the clamping as well as the self-locking. Download and safe the product catalogue for further information!